During the job requisition process in SuccessFactors, the Recruiter is able to easily include qualifications parameters that search submitted resumes that easily eliminate unqualified applicants, thereby immediately reducing the applicant pool to only those that best fit the job. The interviewers are able to enter their scores for qualification categories like product knowledge, listening, communication, etc. during the actual interview. These scores are then averaged for easy comparison and collaboration. Interview Central ensures the right person is hired every time and that their experience with the company starts with a positive and professional impression. Recruiting has positively impacted both the Recruiter and applicant experience by eliminating clicks, improving the look-and-feel of the Careers page and application experience, and reducing application time. As part of the Recruiting project, AspireHR was able to use its own proprietary software, HR DataExchange, to transfer candidates and employee resumes from the existing SAP system into SuccessFactors en masse. 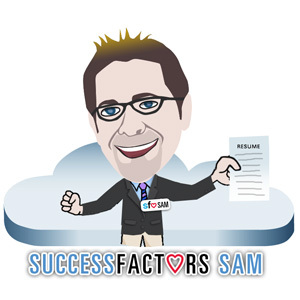 This entry was posted in SuccessFactors Sam and tagged Interview Central, Recruiting, resume parsing, SuccessFactors. Bookmark the permalink.